“Copy and paste.” The words are shouted like a slogan whnever anybody starts discussing the limitations of the iPhone’s operating system. There have been several attempts by third parties to bring the functionality to the iPhone platform, such as the MagicPad app and OpenClip framework, but they’ve all been limited in what they can accomplish without the backing of Apple. Does it work? For the most part, yes (the clipboard app crashed Safari on me once). 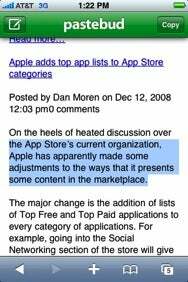 But it’s definitely a little kludgy: selecting your text can be picky, for example, making it clear why Apple chose not to simply go that route for copy and paste. Even more annoying, if you want to just copy and paste a URL, the process is pretty convoluted (unless the URL itself is listed in the body of the page you’re copying). And, of course, it’s only supported in Safari and Mail. While that might account for a lot of copy and pasting needs, I’m not convinced people are going to give up their native iPhone applications just for copy and paste support. The Pastebud team says that they plan to add more features once the initial version is up and running smoothly, including support for SSL to keep pasteboard contents secure, and customization. While the service is free, every time you paste text, you’ll be bugged to pay $5 for the upgraded version (which, at the moment, just omits the Pastebud information appended to whatever your paste). More than anything, though, I think the interest in Pastebud is a signal to Apple that fully functional copy-and-paste support is still something that users are looking for in the iPhone operating system.